The fourth release in the series rights a wrong now nearly seven years old. When Frisell teamed up with Sam Yahel (best-known, at that time, for his work with saxophonist Joshua Redman's Elastic band) and ubiquitous drummer Brian Blade, expectations were high for the tourâ€”and the record that never came. 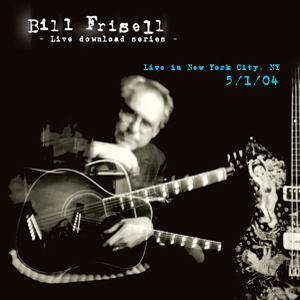 That Frisell has since left Nonesuch after a 21-year run, because he wanted the freedom to release more than one album per year, makes some sense, given the number of unrecorded groups in his Live Download Series. While he'll never be able to keep up with all his projects in commercial form, making this series truly essential, it's a shame that this trio never received broader exposure because, based on this hour-plus set, it was a trio that clearly should have continuedâ€”though, of course, Blade's work in saxophonist Wayne Shorter's quartet, not to mention his own Fellowship Band and singer/songwriter Mama Rosa (Verve, 2009), means that he's a hard guy to pin down. All the more reason to celebrate this download, as the trio digs into Leon Payne's "Lost Highway" with an assertive gospel verve uncharacteristic of the more laid-back Frisell. That's not to say his ethereal side has lost its place with the trio, as he leads Yahel and Blade into a version of one of his earliest pieces, "Throughout," from his very first album as a leader, In Line (ECM, 1983), that demonstrates a lighter side to the organistâ€”and the kind of empathic elasticity that's made Blade one of the most important drummers of his generation, in jazz and beyond.